We’ve teamed up with SA Tourism to explore and celebrate unique approaches to life and culture in South Australia. Mood lighting, air conditioning, icy beverages: three must-haves for surviving summer in Adelaide. You can find them all in one place – well, quite a few places actually. Namely, the ever-increasing number of small bars popping up across the Adelaide CBD. Since the State Government introduced new liquor licensing laws in 2013, niche drinkeries have begun to line the laneways and side streets of the city. With venue capacities capped at 120 punters, these smaller bars provide the perfect scene for relaxed social gatherings, a cheeky knock-off drink, or sipping on some liquid sustenance before a festival show. Whether you’re hitting SA especially for Mad March, or you’re a thirsty city worker playing tourist in your own town, here’s a guide to some of the best small venues to be found around the square mile. Let’s start at the beginning. Lovely Leigh Street in Adelaide’s west end received one of the very first doses of council-sanctioned activation. Bars like Udaberri Pintxos y Vino and caffeine sanctuary Coffee Branch attracted new crowds to the cobbled incline. Running off Hindley Street – also known for its unique brand of vibrancy – Leigh Street got the party started back in 2012. Not long after, the small bar bug was seen headed to neighbouring Peel Street. Another paved haven of small venues, Peel Street runs parallel to Leigh and is lined with charming bars. Intriguing concepts and striking aesthetics have replaced the once empty shopfronts. Adelaide’s gloriously multicultural community is showcased with bars like Kaffana (Serbian), Barbushka (Russian), La Moka (Italian), La Rambla Tapas Bar (Spanish) and Chihauhua (Mexican). Consult Clever Little Tailor for a fine selection of spirits, or soak up the gorgeous art deco décor at Maybe Mae (enter via the tunnel that links back to Leigh). Stay tuned for the precinct’s next addition Pink Moon Saloon, opening soon and rumoured to resemble a ski chalet. By the folks who brought you Clever Little Tailor. A stone’s throw from Leigh and Peel you’ll find Bank Street Social. 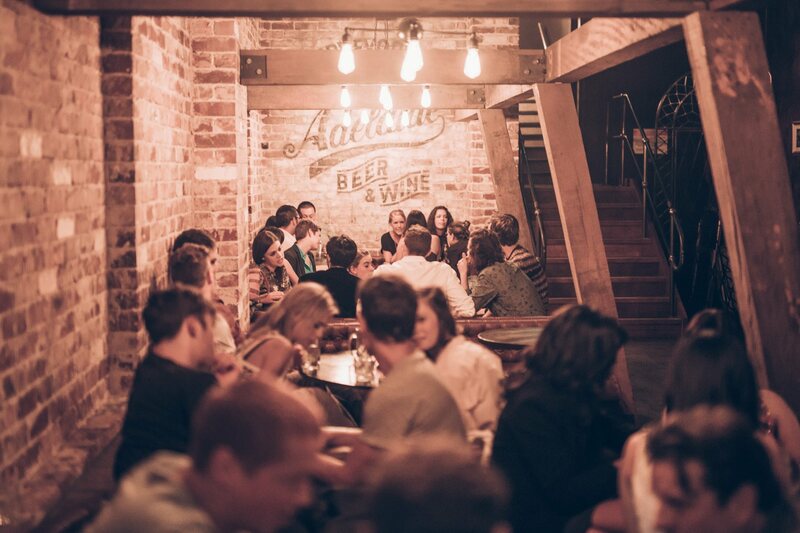 All exposed bricks and enveloping booths, this social club specialises in craft beers, boutique wines, Australian spirits and damn good times (DJs, pop-up markets and live tattooing, to name a few). Bar-other from another mother Pirie & Co. Social Club is situated 15 minutes walk from Bank Street Social. It offers a livelier vibe later in the night care of the local and interstate bands that grace the stage. Expect to see anyone from T-Kay Maidza to Client Liaison drawing a PYT crowd. For the not-so-social butterflies, there’s The Bibliotheca Bar & Book Exchange, serving up serene vibes, low light and a lending library in the west end. This book nook gives a nod to the European small bar tradition. Place a house speciality Pisco Sour in one hand and a well-worn Murakami in the other to complete the experience. If you got game, roll the dice at Austin & Austin – café by day, small bar by night, and purveyor of top-shelf board games around the clock. Challenge your friends to the official Margaret & David At The Movies Board Game, while toasting your Shirley Temple of Doom (rum + Cointreau) cocktails to their Elmer Fudd (Nutella + marshmallow) toasties. Hot damn! Well, not quite. But there are several small bars around town that specialise in a poison of choice. The Howling Owl is the go-to joint for gin, with 30-odd choices of small batches sourced from around the world. When in Rome, try a Kangaroo Island Spirits’ Wild Gin infused with native botanicals, and garnished with hand-plucked spices, fruits and herbs. East end boys and girls will also find Mother Vine in the area, about five minutes walk from The Howling Owl. Pouring imported and local wines by the taste, glass and bottle, Mother Vine has quickly established herself as another high-calibre staple of the Rundle Street precinct. Charge your mason jars for one of Adelaide’s newest haunts, Hains & Co. The nautically themed bar weighed anchor on Gilbert Place with a mission to lift spirits. Its sirens call songs to those who harbour a taste for rum, offering over 25 to select from. The design here is top notch – the bar itself is even constructed from pieces of an old local jetty. Across from Hains & Co’s street-front seating stands the doorway to Vinyl. Head up the stairs, to the right and into its open arms. The airy space is dotted with tables and mismatched chairs, plus some quality nanna-chic wallpaper. Another relatively new venue, Vinyl is one of several that are licensed to host live music. Hindley Street’s Ancient World is a spiritual descendent of former Peel Street party house Format. The ever-evolving space is run by artists who offer punk, electronic and other alternative acts the perfect space for live performance and weekend DJ sets. Misleadingly named The Coffee Pot won’t brew you a damn fine cup of coffee. But they do spruik $5 imported beers, old copies of local newspapers, and very accurately titled “Kate Bush Wednesdays”. Live jazz and blues acts take to the stage weekly, and management have partnered with another small bar, Tuxedo Cat, to present Adelaide Fringe shows until mid-March. This list just scratches the surface. There are many, many more to choose from, and the small bar boom won’t be settling soon. Adding to the 30+ thriving venues, there’s another dozen applications from licensees-to-be awaiting approval in the very near future. In the meantime, explore Adelaide’s scores of small bars on this interactive map, or better yet, in person. Adelaide’s small bars are the cherry on top of everything else the city has to offer, from amazing food and wine regions to the pristine beaches. It’s the gateway to the Barossa, Flinders Ranges and Outback and Kangaroo Island. For more info, click here.